Dream your home’s next chapter with authentic period décor, accessories, entertainment ideas, and renovation advice. 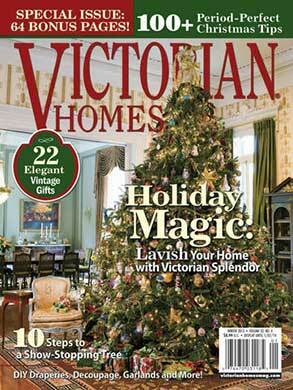 Victorian Homes magazine is dedicated to the history, restoration and decoration of Victorian Homes. You can easily read Victorian Homes on both the iPhone and iPad. You can download single issues now for $4.99. Subscriptions are also available within the application. When a recurring subscription is purchased the latest issue will become available to download immediately. Authentic and vintage-inspired new products for renovating, decorating and accessorizing. Great insider tours to beautifully restored historic homes, house museums and bed-and-breakfast inns. Home decoration and restoration diaries that inspire you to dream your home’s next chapter—and give you the tools to achieve it. Get fresh ideas for collecting and decorating with Victoriana and retro-chic flair—even if can’t own a Victorian structure.